The 2017 Honda Ridgeline has a lot going for that will impress Central Illinois drivers, including powerful performance, fully equipped towing and hauling capabilities, and best-in-class fuel economy—and all at a great price that leaves the competition in the dust. Let’s take a look at some other pickup truck options on the road and see how they stack up to the Ridgeline. In order to achieve such an impressive fuel economy, some drivers might think that the Ridgeline skimps on the performance side of things. 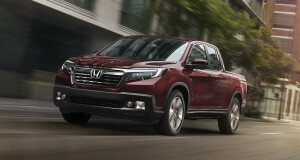 But the Ridgeline offers more horsepower than most of the competitors while maintaining its superior fuel economy. The Ridgeline will produce up to 280 hp, while the Tacoma will only reach up to 278 hp and the Frontier only 261 hp. Unlike its competitive pickups, the Ridgeline comes fully equipped and ready to tow up to 5,000 pounds. A trailer hitch, towing stability, and towing pre-wiring are all a part of its standard equipment. To find those same features on the other trucks, you’ll have to add them as optional features, or explore higher trim levels that have the equipment available. Ready for a test drive of the 2017 Honda Ridgeline? Stop by a Central Illinois Honda Dealer near you today and get behind the wheel to experience this exceptional pickup truck. *Use for comparison purposes only. Based on 2017 EPA mileage ratings. Your mileage will vary depending on how you drive and maintain your vehicle, driving conditions, and other factors. **MSRP excluding tax, license, registration, $900.00 destination charge, and options. Dealers set own prices.